When the new specifications of the 2008 range for Freightliner was announced the increased power available in the Columbia went unremarked. But by specifying higher power in the Columbia model Freightliner has extended its capabilities up into the intrastate B-double market. This test sees the truck hauling a combination loaded to just under 60 tonnes out of Melbourne for a trip along the Princes Highway through East Gippsland. The route is relatively flat but has enough variation in it to replicate the kind of work this truck will be expected to do day-in and day-out, with some open highway running and regular towns en route to get through with tricky tight road junctions to test the manoeuvrability of the truck plus some short climbs to gauge the power available. This model seems to epitomise both the best and the worst of what the North American truck has to offer us here in Australia. The tough and reliable driveline is matched with a superstructure kept sparse by the extremely price conscious United States truck market. Firstly, it offers a solid, dependable and excellently engineered driveline, most of it not Freightliner product but vendor supplied to the manufacturer by industry stalwarts like Cat, Roadranger and Meritor. Secondly, the cabin itself is lightweight with minimal options in the way of extras fitted and with enough room for driver and passenger and very little else. 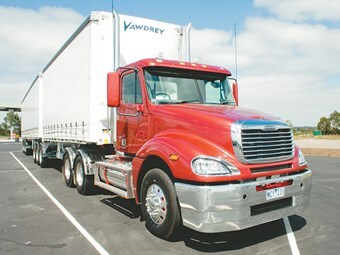 The US fleet market requires very little in the way of creature comforts for drivers and Freightliner offers a similar basic day-cab specification to its North American competitors. 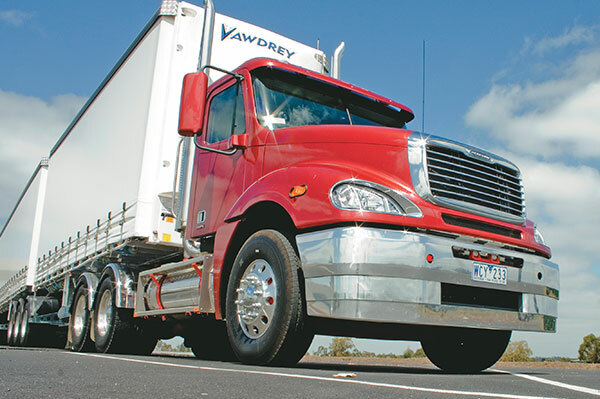 What the Freightliner Columbia does have is a sleek modern look with its well curved front bonnet with inset teardrop headlights, making it look to have a relatively low drag coefficient. The mirrors are shrouded and are painted the same colour as the bodywork, further reducing drag, and the exhaust stacks are tucked neatly behind the cab. The enclosed mirrors work better than the ‘west coast’ style mirrors having rectangular rear view and spotters, taking up less space and giving the driver a better idea of what’s going on behind the cab. Also, a useful down facing mirror is fitted on the passenger side to cover the blind spot on the near-side of the cab. 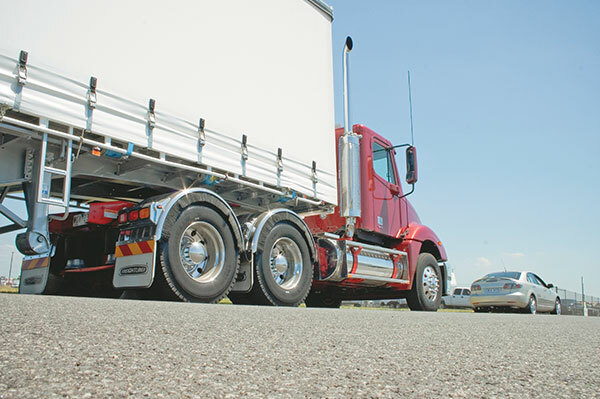 Visibility from the driver’s seat is relatively good for a conventional prime mover with a large engine. The bonnet is quite large but does not compromise the view much and the windows are large enough to help see around the truck. However, a small window in the passenger door would improve the near-side visibility if fitted. The day cab Columbia was fitted with a Caterpillar C15 ACERT engine rated at 550hp and putting out 1,850 ft lb of torque. The driveline continues to the Meritor RT46-160GP rear axles with a 3.91:1 rear axle ratio. This set-up is designed to give the operator enough flexible power to handle intrastate work plus keep rpm levels down at cruising speed. The new ACERT engines are designed to work hardest low down in the rev range and spending too much time operating in the higher rev band around 1,800 rpm can lead to a considerable fuel efficiency penalty. Luckily, the C15 has enough real grunt to mean the driver can keep the revs down, changing up a gear as the tachometer approaches 1,500 rpm without losing momentum. The new ACERT Cat sounds like a big engine, feels like one from the driver’s seat and when push comes to shove delivers the grunt, when required, to handle 60 odd tonnes of B-double. This capability is coupled with the relatively light Columbia design with optimised chassis design and very little steel in the cab itself. Tare weight is claimed by Freightliner to be 7,788kg for cab and chassis only. The actual tare of the model tested is not that low but this model must be one of, if not the lightest, 550hp prime mover available on the Australian market. 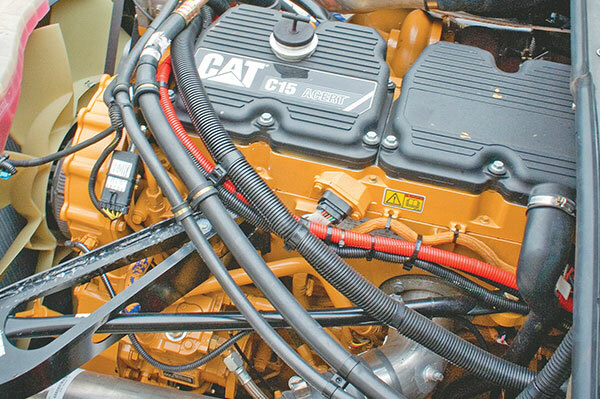 The Caterpillar C15 engine is backed by a manual Roadranger 18-speed gearbox. Once inside the cab is surprisingly spacious with plenty of headroom and no feeling of being cramped for space. While there is plenty of room the same cannot be said for useable storage for the driver — it is minimal. The left-hand drive design allows for a large pocket on the driver’s door. This is not replicated on the other side, the Australian driver’s door. Instead, a blanked off visibility window in the lower door reduces the size of the pocket drastically. Elsewhere in the cab there is little room to store anything for the driver; even the logbook had to live on the passenger seat on this test. There is plenty of floor space for some form of storage and regular Columbia drivers will be able to improvise their own solutions between the seats. Inside the cab the wraparound dash is definitely mounted close enough to the driver to be easy to use. The timber effect on the dash does not look very wooden; plain plastic would probably have looked better. On the right of the central console the trailer brake is mounted in a good position where it is mounted close to the left hand. At the bottom of this console there are two drinks holders and it would seem the drinks in the US must come in different sizes as it is difficult to get anything to stay in them when the truck is moving. The holders do not fold out, they are a solid moulding and as such do not grip the drink in the same way as the more usual fold-away holders. Overhead there are two DIN spaces for radio and UHF and, in a binnacle to the right, a small push button opening shelf. There is also a useful pocket a little further away from the driver, difficult to access but would be very useful in a left-hand drive version of the same truck. The seats themselves are the Ezyrider model available from Freightliner in recent years. They are extremely roomy and comfortable and the right arm rest is useful. However, the left armrest cannot be used as it rests too close to the gear-stick, making it very difficult to change gear (another argument for fitting more Autoshift gearboxes). The seat also lacks an integrated seat belt instead using the B pillar to mount the seat-belt. Out on the road the ride from the Airliner four bag rear suspension and front taper springs on a 4,550mm wheel base is smooth and steady. Surprisingly, it rides better than the same chassis and suspension on Sterling prime movers with the same wheel base. The response to the right foot from the Caterpillar engine is typical: power and torque are available but in their own time. As a driver it is necessary to get into the Cat’s rhythm when changing gear waiting longer for a response than from other engines. However, when the power or torque does arrive, that split second later, it arrives completely. The feel from the engine is reassuring and never appears to be working too hard, coping with the task with aplomb. This combination will have little trouble handling full weight B-double work in and around the city with the broad top torque band making for relaxed gear changing. Tackling a roundabout in Sale and this driver decided to leave the truck in the top box. Approaching in fifth gear low and turning right on a tight roundabout pulling a fully loaded B-double set is quite an ask and the whole combination came around at 900 rpm. There was a little bit of vibration in the driveline but it proved very easy. Generally, there is quite often some vibration coming from this engine and driveline; the power and torque could be described as being heavy handed. This is possibly as a result of the combination of high, heavy power and a relatively lightly built chassis system. 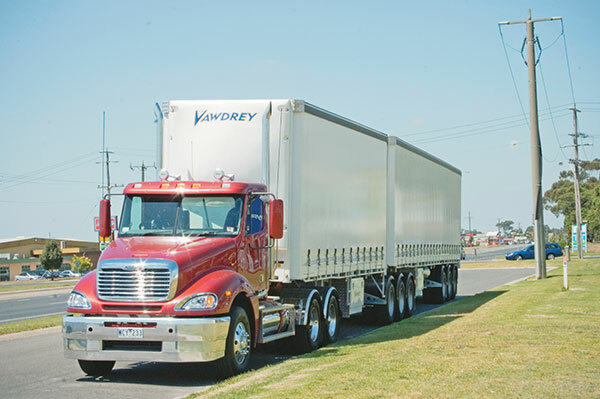 This year has seen the introduction of a new system from Freightliner with the new splayed front section of the chassis making room for a unified engine and radiator package developed for the new lower emission engines. The 1,625 square inch radiator is mounted directly onto the engine before being slotted into the chassis. This makes for a more compact package as the radiator can be mounted closer to the fan as there is no movement between the two out on the road. 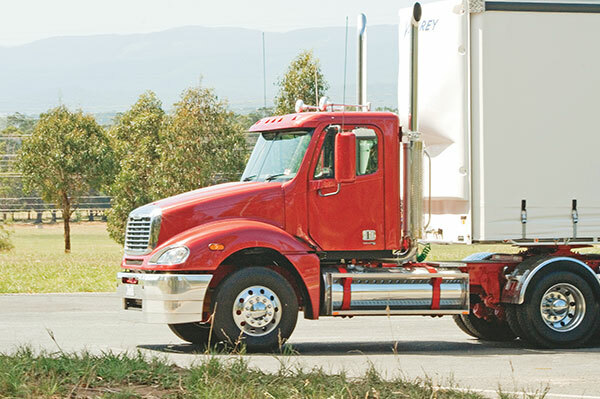 By moving over to this new mounting system Freightliner has managed to increase cooling capacity for the hotter 2008 engines without having to make major engineering changes on the shape of their conventional trucks. All in all the move up the horsepower ratings works well for the Columbia, with truck buyers only needing to choose Century Class at around the 600hp mark. This extension of the specification does call into question the need for two models in similar areas of the market and explains the introduction in the US of the Cascadia models. Cascadia covers applications using both Columbia and Century on one platform designed to be flexible enough to suit all needs. Whether we see this model appear in Australia is not certain but the Century and Columbia models are likely to become more similar over time. For now we have the Columbia up to 550hp and, as this test has shown, the platform can handle the task at this end of the market with a suitable set up of enough power and torque coupled with low tare.